A Behind The Scenes feature of YouWriteOn.com with Edward Smith. How has the site developed over time? We have a lot more literary professionals involved now, including editors from Orion and Bloomsbury who provide free Arts Council funded critiques for the five highest rated writers each month. We also have a lot more leading affiliated literary agents. From the start of April The Random House Group will become involved with YouWriteOn.com and read our Top Ten Chart stories at the start of each month for a six month period. Arh this is the Publishing Service Area . I see that you recently started a joint venture with Legend Books. How did that come about? We were looking to provide a top quality publishing service to help writers who wished to publish. We were delighted when Legend Press agreed to be involved, they're a great publisher and have achieved a lot of success including having one of their books, Salt and Pepper by Candi Miller, listed in this year's Top Ten Books to Talk About for World Book Day. We want to give all writers the opportunity to publish, but also consider that presently in the marketplace there is a mid-list book crisis, mid-list being writers that may not have been out and out bestselling writers but who sold and developed well over time. It's accepted that these writers don't get the opportunities to get published like they did 20 years ago. We want writers to consider their site feedback in making the decision to publish, and have realistic expectations of success and give them guidance to help best achieve this. How do you feel about the publishing industry at the moment and how would you like to see it change? As always there are great writers being discovered and great stories being published. Publishers will sell what's popular, so it's up to individuals personal preference how, for example, they view celeb books and the like. I think what's agreed is that diversity of choice has gone down for readers. This, I think, is partly due to all the other multimedia products competing for browsers hard earned bucks. I would like to see more diversity, choice, and opportunity for new writers, and what I hope for the industry is that it will look into more multimedia ways to promote a variety of writing talent. My analogy is that walking into a library, unless you have an idea of a favoured author, sometimes presents too much overwhelming choice, particularly for a younger YouTube generation who are used to texts and videos in brief little hits. This is why when you walk into stores the Charts are at the front, it's a filtering system, like with the YouWriteOn charts, to make the choice less overwhelming and more bite-sized. I think the industry needs to take this basic premise and use more multimedia and innovative approaches to help entice browsers and cater for bestselling and diverse tastes. A lot of this will happen online, I believe, and we have a number of ideas that we think will help. I believe we'll see publishers take these up much in the same way that big publishers have started sites like YouWriteOn.com since we began. Then again, we may receive our ideas back like a rejected manuscript, but, like with writers we won't know our chances of success until we try. 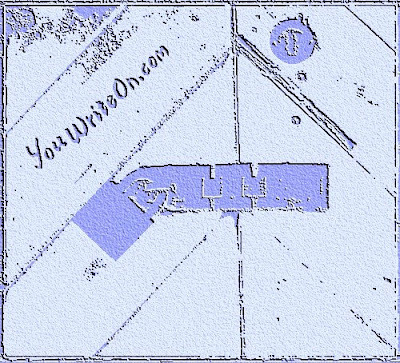 On that note I'd advise all new writers to join YouWriteOn.com! Thanks Edward, it's been great looking around! I'll see myself out. Just to highlight what Edward mentioned above: Random House is to read and consider for publication all top-rated stories for 6 months at YouWriteOn.com. The publisher announced the move, as part of its "commitment to new writing talent." So get in there authors! If you want to join YouWriteOn.com click here. I enjoyed this series, Mike. Thanks. It's good to get this sort of insight into how and where the publishing industry might be placing itself with regards taking on authors and selling books. Nice one. Always very good to see YWO doing so well - I would certainly never have found a publisher for "A Dangerous Man" or indeed "Maloney's Law" (due out in the States in the autumn) without them. Hi Anne good to see you at The View From Here! I had no idea you had used YWO - glad they helped get you out there!